This new hardware platform uses a Cortex-A9 processor with 1 GB RAM and 4 GB of storage, as well as support for touchscreens. VIA Technologies has released a brand new hardware platform called VIA Springboard that aims at Android and Linux embedded developers and startups on a budget, as well as DIY enthusiasts. According to the press release, the Springboard platform "Provides fastest and most stable path to take innovative ideas for Android and Linux smart connected devices from prototype to production." The VAB-600 Springboard Kit is a Pico-ITX board priced at $99 which packs an 800 MHz ARM Cortex-A9 processor with 1 GB of memory, 4 GB of storage, as well as one Ethernet port, mini HDMI, two USB 2.0 ports, and a Mini Card slot. In addition to these the kit also provides a VAB-600_A I/O Extender for two more USB ports, Line-Out and Mic-In audio jacks. Available at $130, the VIA VAB-600 Springboard WiFi Kit offers the same as the above, as well as one VIA VNT9271 Springboard USB WiFi Module. This part features the WiFi 802.11b/g/n Atheros AR9271 controller working from 2.4GHz to 2.5GHz. The Software Development Packages available for download at this time for the Springboard platform feature Android 4.0.3 or a Linux image based on Debian. The hardware kits can be already ordered from www.viaspringboard.com for the prices mentioned earlier, plus shipping. Taipei, Taiwan, 31st October, 2013 - VIA Technologies, Inc, a leading innovator of power efficient computing platforms, today announced the launch of VIA Springboard, a unique platform developed to provide embedded developers, start-ups, and DIY enthusiasts with the fastest and most stable path for prototyping next-generation ARM-based smart connected devices and taking them to mass-production. VIA Springboard provides a tightly-integrated platform of hardware kits, Android and Linux software development packages, and support services that covers all stages of the development process, including rapid system prototyping, application development, hardware and software customization, and pre-production testing and diagnostics. With a three-year longevity guarantee, customers can also be assured that VIA Springboard platforms will be available throughout the entire product life cycle. VIA Springboard Kits are available for global purchase in two configurations at www.viaspringboard.com. The VIA VAB-600 Springboard Kit features an ultra-compact VIA VAB-600 Pico-ITX board with an I/O extender card, A/C adaptor, and COM and USB cables, and is priced at US$99 plus shipping. 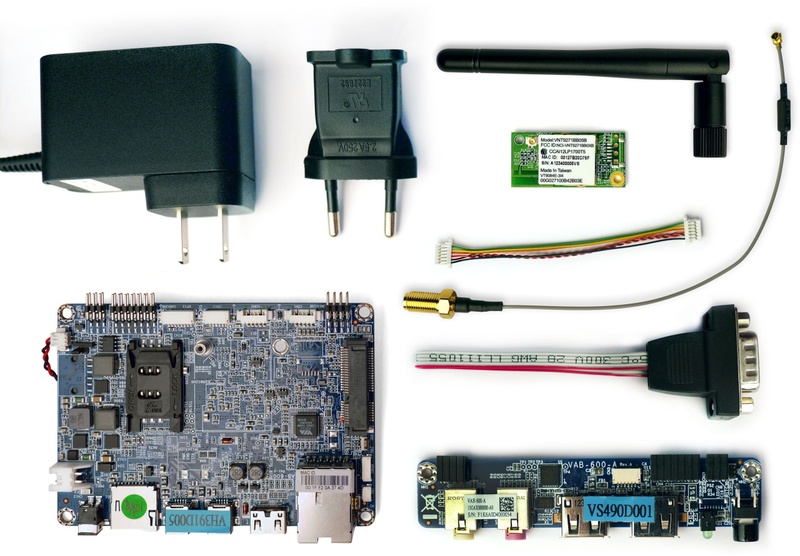 The VIA VAB-600 Springboard WiFi Kit also includes a USB WiFi module and is priced at $129 plus shipping. The VAB-600 board can be configured with a choice of Android and Linux Software Development Packages that are available for download from the VIA Springboard website. The Springboard Android Software Development Package features Android version 4.0.3, and includes the kernel and bootloader source codes as well as a Smart ETK comprising a number of APIs, including Watchdog Timer (WDT) for safeguarding against system crashes, GPIO access, COM port access, RTC for auto-power on, and a sample app. The Springboard Linux Software Development Package has a pre-built Debian image, including the kernel and bootloader source codes, and also comes with a Tool Chain to help make adjustments to the kernel and to leverage the onboard pin-headers, GPIO, I2C, and other hardware features. Based on the ultra-compact Pico-ITX form factor measuring just 10 cm x 7.2 cm, the VIA VAB-600 integrates a low power 800MHz ARM Cortex-A9 SoC and is packed with advanced multimedia features, including a built-in multi-standard decoder for playback support of the most demanding video formats in resolutions of up to 1080p. The VIA VAB-600 includes a wide array of rear I/O features, including one Mini HDMI port, two Mini-USB 2.0 ports, one 10/100 Ethernet port, and one 12~24V DC-in jack. Other onboard features include 4GB eMMC Flash memory, 1GB DDR3 SDRAM, one DVO connector, two COM ports (one for TX/RX only), SPI, one USB 2.0 connector, one Mini Card slot, touch screen support, front pin headers for line-in/out and MIC-in, I2C and GPIO pin headers. Combining a wide operating temperature range of 0°C up to 60°C with extremely low power consumption, the VIA VAB-600 is designed to operate in even the most extreme environments. The VIA VAB-600-A I/O extender card adds multiple I/O interfaces, including Line-Out and Mic-In audio jacks and two USB ports. Measuring 100mm x 20mm x 1.6mm (L x W x H), the card also features one suspend LED power indicator and a power on/off button as well as three board-to-board connectors and one USB board-to-board connector. The VIA VNT9271 Springboard USB WiFi Module enables the fast and convenient integration of high-speed wireless capabilities into the VIA VAB-600 board. Featuring the Atheros AR9271 controller chip, the module is fully compliant with IEEE 802.11b/g/n standards working from 2.4GHz to 2.5GHz. In addition, the module can provide up to 11Mbps for IEEE 802.11b, 54Mbps for IEEE 802.11g or 150Mbps for IEEE 802.11n to connect the Wi-Fi client to a Local Area Network or the Internet. 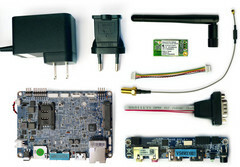 The VIA VAB-600 Springboard Kit and the VIA VAB-600 Springboard WiFi Kit are available for global purchase atwww.viaspringboard.com. The kits are priced at $99 and $129 respectively, plus shipping.